I’ve recently discovered a new love, and that is Paton’s Roving Wool. It comes in beautiful colors, its thick and squishy and warm, and knits up fast. Another huge bonus is how neat and flat it lays, being wool it doesn’t have the twisted texture of many cotton or blended yarns. 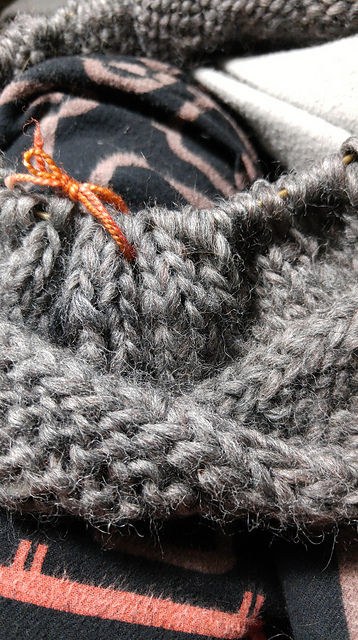 Hence my search for the perfect pattern for this perfect yarn. (I’ve actually already made a jacket out of it, which I will post about later, once I get around to weaving in all the pesky ends and knitting the collar). The main downfall is that the yarn is wool, you can’t machine wash it (unless you’re felting it), and it is a little scratchy. But its pretty. Since cowls and infinity scarves are very much in style at the moment, I searched Ravelry for scarves for Bulky Weight yarn, but I didn’t find any I really liked, so I went up to SUPER Bulky and found Lara’s Cowl which I fell in love with. I also made the mistake of buying my yarn before picking a project, because I fell in love with the Plum colorway so I bought two skeins and went for it.